The Houston Texans have made an important decision about their leadership for the long term. On Saturday, the team announced that head coach Bill O’Brien has been given a four-year extension. The Texans have also hired Brian Gaine to serve as their GM, signing him to a five-year deal. The extension for O’Brian is a little surprising. Late in the season, there was speculation that he could be fired on Black Monday following a 4-12 season. 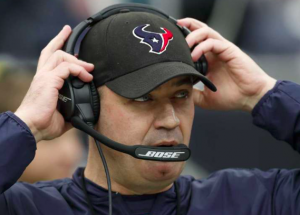 When he wasn’t fired after the season, it appeared as if O’Brien would enter the 2018 season as a lame-duck coach in the final year of his contract. However, a contract extension at this point gives O’Brien a vote of confidence from owner Bob McNair. Before this year’s 4-12 campaign, O’Brien led the Texans to three straight 9-7 seasons. In 2015 and 2016, that 9-7 record was good enough to win the AFC South. Many of Houston’s issues this season came after rookie quarterback Deshaun Watson was lost to a season-ending injury. Before the injury, Watson had started to establish himself as Houston’s quarterback of the future. Watson’s presence makes it easier for the Texans to move forward with O’Brien at the helm. Gaine, meanwhile, comes to Houston after serving as vice president of player personnel for the Buffalo Bills this past season. From 2014 to 2016, he worked in Houston’s player personnel department. Current Texans GM Rick Smith is taking an indefinite leave of absence while his wife battles breast cancer. However, Smith will retain the title of executive vice president as Gaine takes over duties as GM. Gaine’s familiarity with O’Brien and Houston’s personnel should make the transition an easy one for the Texans. Despite a down year, the Texans don’t need to undertake a massive rebuilding project. If players like Watson, J.J. Watt, and others come back healthy in 2018, the Texans should be in good shape to compete for another AFC South title next season. Of course, the AFC South is much more competitive than it was a couple years ago. The division includes two of the four AFC teams still playing heading into the Divisional Round of the playoffs. In addition to the Jaguars and Titans, the Colts could also pose a threat in the AFC South if Andrew Luck comes back healthy in 2018. However, with O’Brien’s future secure and a new GM with familiarity with the team in place, the Texans should be in good shape moving forward.